I saw these baby booties and just HAD to make some for the twins that I gave the Baby Shower for. When I completed the first bootie I started taking pictures; the button isn't on and the strings are not finished off in these pictures. Can't you just see these with an adorable pair of little baby jeans? The twins are not identical twins, they are fraternal, and mom is not wanting to dress them identical. 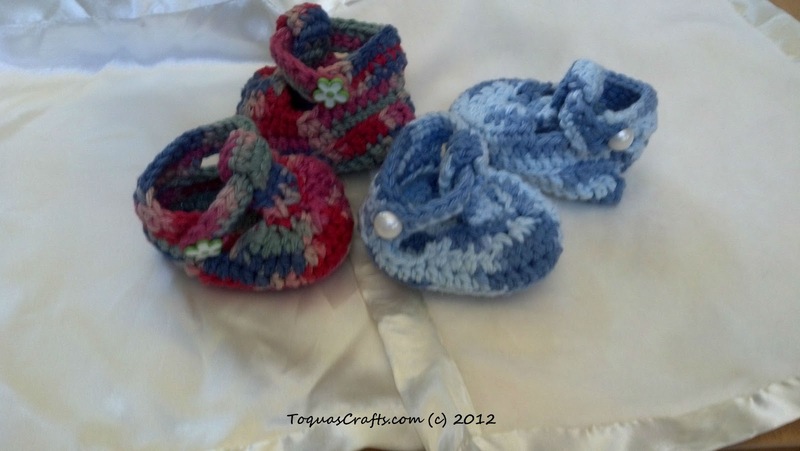 Therefore I purposely made the second pair of booties a different color. I also wanted to be sure to use a fun button with the 'red' booties. The red booties were actually mom's favorite! I didn't have any cutie patootie socks to stuff for the photos. But you get the idea. Cedar Hill Ranch: Cowgirl UP! so cute Toqua! I knitted a couple of times years and years ago. I have never crocheted. My mom and sister did a LOT. Super cute! I like that little T-strap (makes them seem more like little shoes). So cute! I love the little buttons you added. So glad you linked up at Etcetorize this week! OH my goodness -they are adorable!